It's almost Christmas - and that means that some of you will put up a tree. Some of you who put up a tree also have cats. Some of you who put up a tree who also have cats are also uninformed about things, so I'm going to chime in at the risk of sounding like a jerk. I do love cats...so that's why I'm saying it. Tinsel. Cats are notorious for doing things like going after strings. I've had to yank a yarn piece out of my cat's mouth once that was about two feet long. About a foot and a half of it was way "inside" of my cat. I love the film "While You Were Sleeping" - but I get so mad at the part where Sandra Bullock goes to open her door and drapes the strands of tinsel over her cat's head. Tinsel doesn't "digest" like a natural fiber and can strangle a cat's intestine and doesn't always pass right through the cat and out into their litter box. Please, if you have cats, use something else that isn't so fascinating for a cat. Dangling ornaments. If you are going to have them, and your cat is prone to knocking them off the tree...please just use string instead of one of those metal hooks to tether them to the tree. Trust me...the cats have a much harder time trying to unloop a string than to bat a hook-type ornament off. Plus, the likelihood that your cat ingests a broken ornament or the hook (and we used to use actual fishing hooks when I was a kid) is greatly decreased. Tree-toppling. Yes, we've had our tree knocked over because the cats climbed it. Nothing "better" than hearing a crash sound and seeing a cat running. Do what I do. Buy some of that thicker fishing string (again - the fishing motif here) as it is "clear" and unobtrusive...and hook at least two sides of your tree's top to opposite sides of the wall or ceiling (a triangular pattern is best, if at all possible). If the cat climbs up...and it's prone to falling over...it won't. The most it will do is wobble...this works, I've done it every year since the tree-toppling incident. Granted I don't have 12 foot ceilings or anything - but with a regular-sized tree - they haven't gotten it to fall over since. And, if someone has figured out how to get a cat who loves to pee on the tree skirt...to stop peeing on the tree skirt...especially while all the pretty boxes are under the tree, absorbing the pee...feel free to let me know. 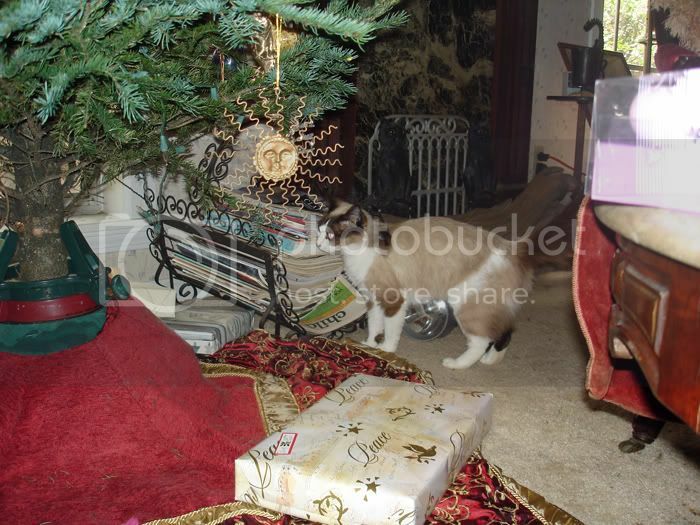 I have one cat that apparently thinks the tree skirt is a fancy litter box to use during the holidays. I don't have a cat any more but good advice there. My cat used to like ripping the wrapping paper to shreds . Never had a cat pee on the skirt, but I guess that's probably because all of my cats have been outdoor cats and they knew better than to pee indoors, period. Not a cat fan. Might I suggest replacing the tinsel with razor wire? I loved as much as you'll receive carried out right here. The sketch is tasteful, your authored subject matter stylish. nonetheless, you command get got an nervousness over that you wish be delivering the following. unwell unquestionably come further formerly again as exactly the same nearly very often inside case you shield this increase. Have we perhaps backslid on our promise to post every few days? I know. I have been sleeping non-stop the past few days - I don't know why, but I have. I stay up only about four hours and then I go to bed again. I started a blog at the doctor's office today but it's lousy. I will really, really, really try to do one tomorrow. am really happy to read everthing at one place. "Non-stop sleeping." That sounds kind of Carlinesque. And I agree with Anonymous's sentiments. I am also really happy to read everthing at one place. Even though it's not my first time go to see at here. Yes, gotta love those anonymous ones.